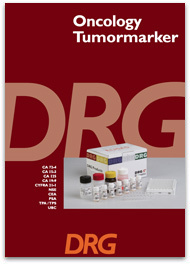 DRG developed tumor marker (TM) assays several years ago to offer these excellent tools to diagnostic routine and research laboratories. The first group of TM Elisas utilized the original Gold Standard antibodies of Centocor (FDI), like CA 125, CA 15-5, CA 19-9, CA 72-4 and CYFRA 21-1. For many years DRG is completing this product line of kits with assays for the determination of NSE, TPS/TPA, PSA, CEA, Chromogranin A, UBC and many more. 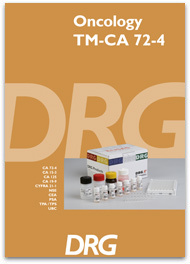 First quarter 2011 DRG launched a new generation of TM assays: TM-CA 125, TM-CA 15-3, TM-CA 19-9, TM-CA 72-4 and TM-CYFRA 21-1. These tests offers an excellent correlation to other kits, that are commonly used in the market. With this new line we will continue the successful story of DRG tumor marker assays. Additionally, DRG is working in close cooperation with well-known research institutes to develop new helpful tools in tumor diagnosis and monitoring. 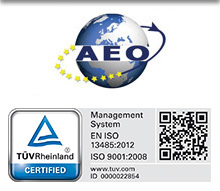 Recently we have launched the new Elisas L1-CAM and CYR61.